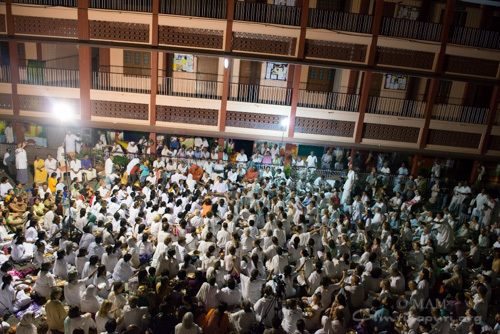 With such a huge group, we expected Amma to travel on her own, and that our caravan would just follow at its own pace. But would Amma agree to this? No, she didn’t. Our journey lasted more than 24 hours and Amma was moving along with the caravan the entire time: At 4am on the 13th everyone had given their bags for loading; at 4:45am on the 14th, we reached Mangalore along with Amma after a memorable travel day. Jai Ma! 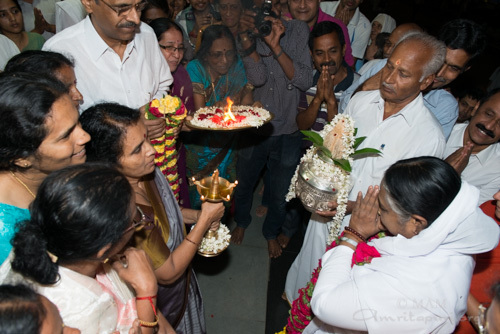 Blessings on all the tour sevites, and on all the children Amma is traveling to see. 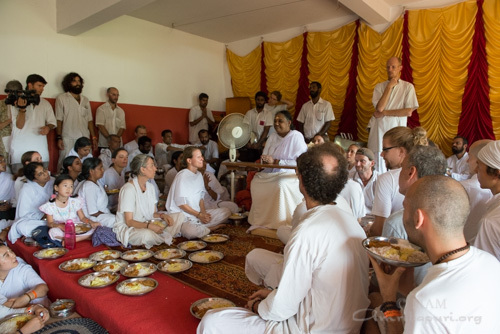 “Akaasath Patitam Toyam Yadha Gacchati Sagaram”; even as rain water from the sky above fallen to the ground flows towards the ocean; the tiny droplets i.e., AMMA’s children form a river of love and flow towards AMMA, the Ocean of Pure Unconditional Love. Previous Post Preparing the path where there is no road….